Is this a typical restoration? Well, in the sense that it is a reasonably complete bike with mostly original fittings, no. 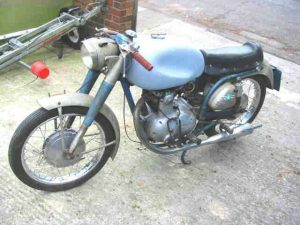 Many projects start with modified or non-standard bikes which will need long hours of searching at autojumbles and on the internet to find parts to bring them back to original – if that’s what you want. It is a typical bike in the sense that most of it is worn out & what work has been done on it during its life hasn’t been to the highest standard….that’s a polite way of saying bodged. Firstly get a decent digital camera (with a macro setting if possible) & take pix from every angle of every major component, its fixings & position in relation to other major components plus any odd looking or possibly non standard items. These can then be emailed/sent to self appointed know-it-alls (moi? surely not) to spot the oddity or tell you whats missing (but probably not where to get it). You will never remember where every nut & washer goes so these pix are invaluable. Take more as the stripdown progresses & write notes to remind you what is missing or needs attention/replacement. You will have a looooong list by the time the real work starts but you can start stocking up on wants straight away. Very much a personal thing but I’ve settled on an order which suits me. One aspect of restoring old bikes that can be frustrating are the long periods where you are spending money fast, working long hours on it & seeing no improvement or progress. In reality you are getting there but you see the same boxes of bits lying about. I like to spice the process up by gathering the chroming together early on in the rebuild & sending that off. That usually takes a few weeks to arrive back by which time you are bored to tears of degreasing frames & engines. The sight of some beautifully rechromed parts raises the spirits…momentarily. Likewise the petrol tank. It can be a great boost to do that early on & look forward to the day it can sit on a restored frame & cycle parts. The welded on clutch centre……OOOH DEAR !!! Early 175 slipper cam chain tensioner. So this is the order I do things……. I like to get the engine out of the frame early on. Don’t try & take it out complete. Often it physically can’t be but that is not the reason. As long as the rear wheel & chain are in place the rear brake can be adjusted on to lock the wheel solid & this provides a valuable service when tight nuts on the clutch centre/mainshaft/gearbox sprocket need to be undone. Note that the engine has been dismantled “in situ”. The primary drive, cam drive, & entire gearbox have been removed along with the cylinder head , cylinder & piston. Before we move on lets look at what was in the timing case of this engine. A cam chain the like of which I’ ve never seen. Normally the OE “Elias” chain is a plain oblong sideplate. This one would look more at home in a chain saw. If you look at the “cam drive” section of the site you can see the damage it did to the timing cover when the tensioner failed. The OE chain is no longer made but a modern replacement is available with a more appropriate profile. This is the type of chain tensioner found in the engine. A rather sorry looking original.